2 in 1 Venus playset with siren sound FX and phrases. Shoot out the water from the tank! Opens out into emergency response unit with firefighting accessories! 2 in 1 Venus Playset with siren sound effects and phrases. Shoot out the water from the tank. Opens out into emergency response unit with fire fighting accessories. Plays theme tune and phrases from the show. Working water tank that squirts real water. General information: Batteries required: 3 x AAA; For ages 3 years and over. EAN: 5029736042967 WARNING(S): Not suitable for children under 3 years old. This toy costs approximately £19.99 (for the latest and best prices make sure you check our retailer list for the Fireman Sam Venus Vehicle Playset above). 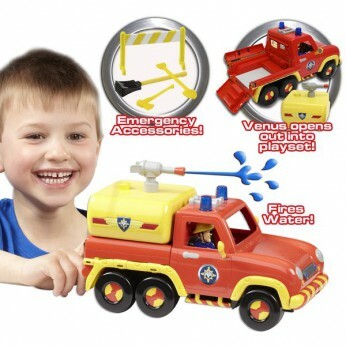 In our review of Fireman Sam Venus Vehicle Playset we classed it as being suitable for ages 3 years, 4 years, 5 years but recommend you check the manufacturer specific advice before purchasing.